We were first called in to look at the former organ in St. Mary’s in May 2011, the instrument was originally built by George Holdich in c1866, a relatively modest tracker organ of 18 stops which was placed in a chamber on the North side of the chancel, speaking through two low arches on the West and South sides. 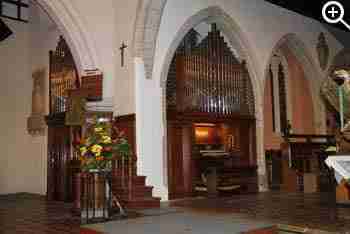 The organ was then restored and electrified by Rushworth & Dreaper in 1955, it was finally repaired and enlarged by Hill, Norman & Beard in 1979. The organ was in a very bad state, and after much discussion, the church authorities entrusted us with the contract to build a new organ. The specification evolved somewhat along the lines of the original organ, as the layout and purpose of the instrument were broadly the same. The church has a fine robed choir, and the organ was expected to accompany choral singing, lead congregational singing, as well as perform in solo and teaching roles. The Great Organ is fairly standard, but we opted for a traditional capped and slotted English Clarinet, which has proved to be an extremely useful stop. The Trumpet has domed French shallots to add a splash of colour in solos and to full organ. Our one regret was that there wasn’t room to fit a 16ft stop onto the Great. Although very bright and bold at the console, the Great balances very well in the main body of the church. The Swell Organ is very much geared to choral accompaniment. The Open Diapason is a very important stop in this role, the bottom 8 notes are Haskelled and were made by Terry Shires. The gentle strings are modelled on Father Willis Salicionals and are unbearded throughout. A rather perky 4ft Stopped Flute (made of African walnut) sits well on top of the Lieblich Gedackt made from spotted metal. The flue chorus is topped by a principal-based Sesquialtera; consisting of a Twelfth and Seventeenth from bottom to top. This can be used either as a piquant mixture or as a reedy solo Cornet. We felt that two contrasting 8ft reeds would be more useful than the usual attempt at a compromised 16/8ft mini cathedral Full Swell; they consist of a capped English Oboe and a bright, modestly scaled Trumpet with open “Hill” style shallots. The Pedal Organ is based on a very solid 16ft Bourdon, topped with an 8ft Principal (partly on the West façade) and a rather nice independent 8ft Bass Flute made of pine. A little definition is provided by a 4ft Fifteenth, and finally a full throated wooden Trombone - again with domed French shallots adds plenty of grandeur without overpowering the organ. The Swell box has shutters on the West and South sides, and greatly helps the projection of the organ westwards, this is particularly noticeable in the North aisle. The box is extremely effective, which always makes a modest organ far more versatile. We think we have succeeded in creating an organ which fills its requirements, despite the handicap of being in an unhelpful organ chamber and being in a very acoustically dry building. The organ was dedicated by the bishop of Southwark on the 15th of November 2015 at the anniversary service celebrating almost exactly 900 years since the founding of the church. The first concert (involving many of the various musicians of the church) was held on the 24th January 2016. 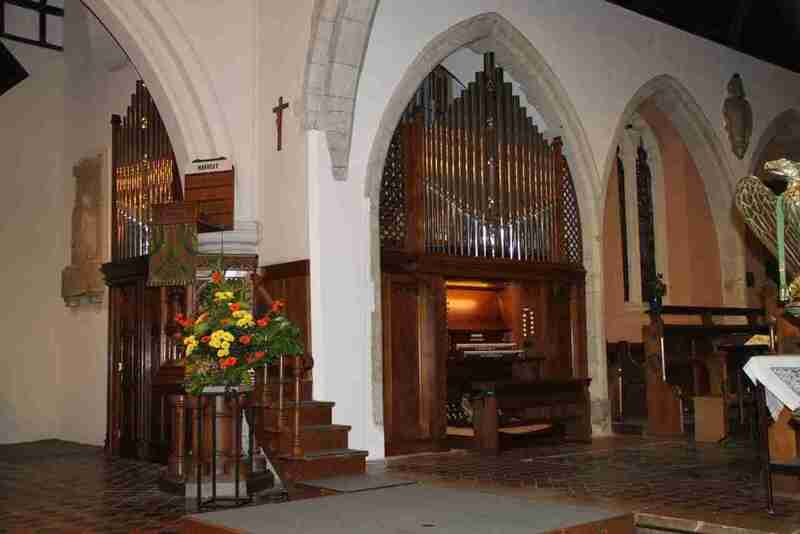 View the Specification of the St Mary the Virgin's church organ.